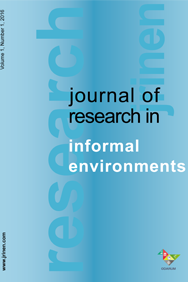 The Journal of Research in Informal Environments is an open access and peer reviwed journal which publishes manuscripts relating to teaching-learning activities in informal settings and the effects of these settings on different variables. JRIE also welcomes distinctive maniuscripts that includes review of book or article(s). All the manuscripts must be submited electronicly via onine submission system. The journal considers research studies for publication submitted by scientists from all disciplines.